Omar Khan is with Boardwalk Wealth and is responsible for capital raising, strategic planning and investor relations. He has over 10 years experience in investing across real estate and commodities, with $3.7 billion in capital financing and M&A transactions, Syndicating large multi-million dollar dealsacross the US, and advises high net-worth individuals and entrepreneurs on real estate portfolio allocations. Today’s episode is for those really wanting to get their first multifamily investment and aren’t afraid to put in the work. 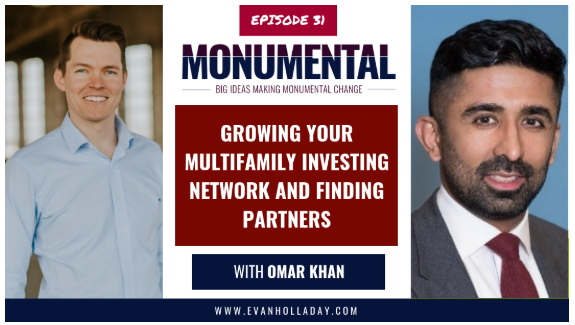 We discuss with Omar the importance of networking and learning from mentors, partnering with others on real estate but making sure to vet your partners, and how to find a deal and how to make sure you and your investors win on that deal!